Our Weddings Team would like to invite you to Swinton Park’s open day, have a look around the rooms available and meet with one of our coordinators to go through all your wedding requirements and create your dream day. Be greeted in the Lower Hall with a glass of fizz. The Library, with stunning views overlooking the deer park, the Panelled Room, for a more intimate celebration and the Private Sitting Room, which hosts the Wedding for Two, will all be set for a wedding ceremony. The grand Samuel’s dining room will be available to give you a perspective and great ideas on how it will look on your big day. Swinton Bivouac will also be open, situated just 3 miles away it creates a wonderful setting for an outdoor woodland wedding (please note, Swinton Bivouac will not be set for a wedding). Swinton Park is a luxury Grade II castle set in 200 acres of beautiful parkland grounds at the Swinton Estate. 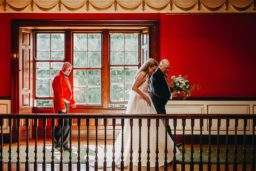 Owned by the Cunliffe-Lister family since the 1880s, and the ancestral seat of the Earl of Swinton, you and your guests will enjoy a traditional, yet informal stately home wedding experience. Whatever the size of ceremony and whatever the requirements, we have the space and the imagination to accommodate. Appointments can be made by emailing us on weddings@swintonestate.com or calling 01765 680972. For couples who put down a deposit for their 2019 wedding at the Wedding Open Day on 23rd March 2019, you will receive a complimentary Dinner, Bed & Breakfast stay* at Swinton Park with access to Swinton Country Club & Spa. *Two people staying in a Knights room. Stay to be taken by 31st December 2019. Offer applies to weddings booked for 2019 with deposits paid on 23rd March 2019, new bookings only. Subject to availability, normal T&Cs apply.